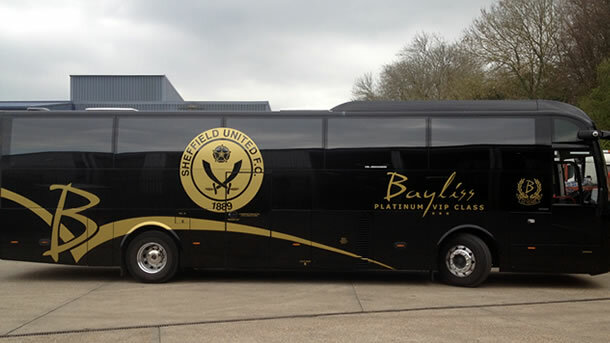 Bayliss Executive Travel Ltd has offered the Blades a special luxury Sheffield United branded (sides and rooftop) coach featuring screens, kitchen, leather seats and other executive facilities. The coach, until recently, was used by Glasgow Celtic as their team bus. On European home nights the Scottish club offered the coach to opposition teams such as Barcelona and Juventus. “It’s got a real pedigree,” said Managing Director Alistair Bayliss. “We hope the players are inspired by the coach and that it makes a little bit of difference on Sunday. “We have a great relationship with a lot of people at the club going back to when the Blades were sponsored by Visit Malta, who we provide executive travel for in this country. My first club is Aberdeen but I am very much a fan of United, as is my assistant manager Rob Marriott who will be driving the coach." Sheffield United Managing Director Mal Brannigan said: “"This is a great gesture by Alistair and his team, who have been long term supporters of the Club"
Based in Deal, Kent and celebrating their 10th anniversary next week, Bayliss has 14 coaches and executive vehicles and work with a lot of sporting organisations across the UK as well as providing a range of other services including cruise ship transfers.